Potter Park Zoo’s annual start-of-summer celebration – Wine and Stein 2015, Thursday, May 21st – is a great way to sample wine, craft beer, food, and live music in a casual and friendly zoo setting. Lansing’s 12th Annual Festival of the Sun takes place Saturday, June 25, 2011, between 2 and 11 p.m. Guests of our Lansing Michigan Bed and Breakfast always rave about this festival, and we are frequently booked months in advance. It is, simply put, a feast for the soul. Why? Because nothing celebrates the solstice like good food, good wine, and good music. Festival goers need bring only their appetite – everything else is provided. Featured wines this year come from Michigan, California, Argentina and beyond. They’ll be paired with food ranging from delicate stuffed grape leaves to “trailer park’d” burgers and bratwursts. New this year at the Festival of the Sun is the Pairing Tent, where festival-goers may enjoy an authentic wine tasting experience: three wines will be served with a sample sized three-course meal. Attend and you’ll have the menu for your next dinner party. It wouldn’t be a festival without live music. Look forward to music by the Elevator Conspiracy, the Tree Hut Kings, Summer of Sol, and more. Wisaal, Tania Hayward, and Sunny Side Up will play the acoustic stage, along with several others. Music should accompany all of your tastings, be they food, drink, or both. Sound fun? It always is. If you can’t make it this year, be sure to put it on your calendar next year. When you do, be sure to book a room at our Lansing Bed and Breakfast. Festival of the Sun is June 25, 2011. For more festival information, please visit Festival of the Sun. 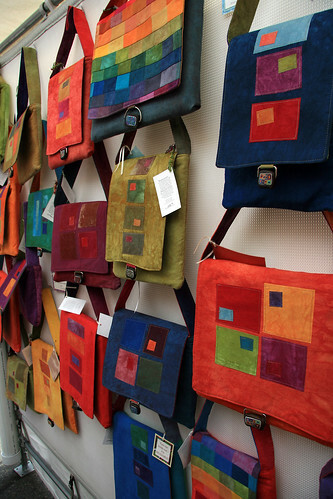 Hand crafted purses at the East Lansing Art Festival. May 21-22, 2011, is the 48th Annual East Lansing Art Festival in downtown East Lansing. Allow yourself plenty of time to enjoy the festival – stay the weekend at our Lansing Bed and Breakfast. Hundreds of artists descend upon East Michigan during the ELAF. They come from all over Michigan, and some even venture from other states. Their stalls feature all art mediums: jewelry, metalwork, photography, sculpture, paintings, ceramics, sculpture, woodwork. You may speak with the artists, purchase their creations, and in some cases watch them make their artwork. No art festival is complete without live entertainment. The East Lansing Art Festival features a great variety of live music, as well as many different performances, demonstrations, and activities. Dance to the Bossa Nova sounds of Sheila Landis & Brazilian Love Affair; boogie down to Freddie Cunningham & The Root Doctor Band, and sway to Cloud Magic and their funky, jazzy, psychedelic sounds. Keep an eye out for Crazy Richard The Madd Juggler, too. After spending the day on your feet at the East Lansing Art Festival, head back to our peaceful Bed and Breakfast near Lansing MI. Refresh yourself with a pint at the pub before dinner, or sit in our colorful English gardens for a spell. It’s delightful. Additional information is available at East Lansing Art Festival. Summer evenings were meant to be spent out of doors. With this thought in mind, the community of East Lansing is filling summer evenings with music and film. When next you stay at our elegant Lansing bed and breakfast, slip out for some cool entertainment under the stars. Free live music fills Fountain Square in East Lansing on Friday nights, and Ann Street Plaza on Saturday nights. The concerts run from 7 to 9pm. Free films are presented Thursday nights in Valley Court Park. Films start at 9:30 in July and 9pm in August, and live music begins an hour prior to the films. Before the shows, enjoy dinner at our Lansing fine dining restaurant. Now that the weather is warm, we offer alfresco dining on our terrace. Live piano music will accompany your dinner on Friday and Saturday evenings. Start with caviar for two and then share a Chateaubriand, accompanied by the perfect wine from our award-winning wine list. Then head to East Lansing for a splendid summer evening of music or movies.